Plymouth University Peninsula School of Dentistry has boosted its provision for postgraduate training with significant additions to the existing team. 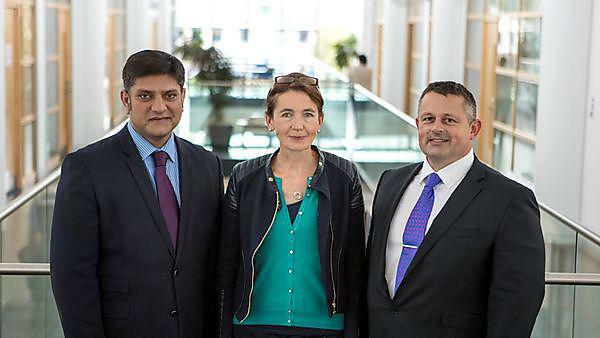 Eithne Fyfe has been appointed to the role of Consultant in Oral Surgery and Tim O’Brien to the role of Associate Professor/Honorary Consultant in Restorative Dentistry. Dr Kamran Ali (who recently achieved his PhD) has also been appointed to Consultant status and is now an Associate Professor (Senior Lecturer) and Consultant in Oral Surgery. Eithne and Kamran are working together to develop a new Certificate, Diploma and Masters in Oral Surgery. Eithne qualified at Guys Hospital and went on to undertake her junior training posts in oral and maxillo-facial surgery at the Royal Devon and Exeter Hospital. She works part-time at Bristol Dental School where she is Clinical Governance Lead for Oral Surgery and teaches both undergraduates and postgraduates in oral surgery. Tim qualified at Guy’s Hospital in London and has worked in a range of practices, including one in Australia. He undertook specialist training at the Eastman Hospital in 1997, remaining there to teach dentists training to be specialists. He joined Peninsula in 2012 and was initially funded by the National Institute for Health Research to undertake training in additional specialities and to participate in research – focusing on how to make dental care safer for patients. He completed a second course of specialist training, in restorative dentistry, in 2015 and has stayed at Peninsula, developing the suite of postgraduate programmes on offer. He is an examiner for the Royal College of Surgeons in Edinburgh and London and acts as an expert witness in legal cases and other matters under consideration by the General Dental Council. Kamran joined Plymouth University Peninsula School of Dentistry in 2009. In 2012 Dr Ali received the “Excellence in Dental Education Award” given by the Association of Dental Education in Europe (ADEE). He is a member of the Association of British Academic Oral and Maxillofacial Surgeons where he sits on the Dental Education Committee; the Dental Sedation Teachers’ Group, where he is School representative; the Higher Education Academy; and the Association for Dental Education in Europe. The news comes hard on the heels of the announcement that the Faculty of General Dental Practice UK (FGDP[UK]) has entered into an agreement with Plymouth University Peninsula School of Dentistry (PUPSD) whereby dentists with an FGDP(UK) Diploma in Restorative Dentistry can join the PUPSD MSc in Restorative Dentistry, leading to the award of an MSc in restorative dentistry from Plymouth University.